Fidei: Obama fiddles while the world burns! 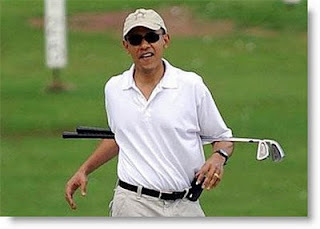 "For him to be playing golf the day of and the day after... I think is very inappropriate... The image of him on a golf course while Japan is in the kind of trouble, this is catastrophic trouble, I think is totally inappropriate, and I say that as a person who owns some of the greatest golf courses in the world!" "Listen up dumbo, your job is to raise the price of oil, destroy the US economy so we can plunder it by buying up assets cheap and stealing trillions from the Federal Reserve and Bailouts/Stimulus and tear down conservative American institutions and replace with Marxist-Leninist ones so we can control people, after you do that you're free to party, vacation, watch sports and golf all you want!"